The Goddess in her form as the Crone represents the depths of inner experience. She is death and decay, the shadow of self and the darkness that we avoid. But, within this death and decay lay the ingredients for renewed life. It is from the ashes that the Phoenix rises reborn. It is from the place of the shadow that the Light may be revealed and it is from embracing those parts of ourselves that we are most fearful of that the greatest growth occurs. 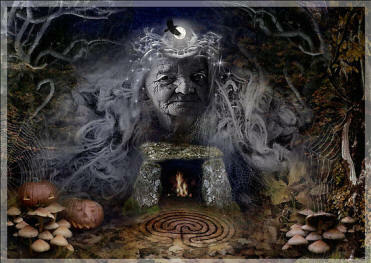 The Crone is the necessary tri-form needed to remain in a place of newness (Maiden) and creative fullness (Mother). She completes the cycle of Nature and it is within her bosom that we find rest at the end of our time. The color black is associated with the goddess in her aspect as the Crone. Black is the absence of color or the all inclusive pallet of every primary color mixed together. This is the work of the Crone as well. She lays hidden in the place that is no place , no time and draws to herself the streams of all energy creating a space of night and quickening. This entry was posted in YAD-Lesson Three, Year and A Day Course and tagged Crone, Deity, Divine, Goddess, Triple Goddess, Wicca Course-Lesson Three, YAD-Lesson Three. Bookmark the permalink.